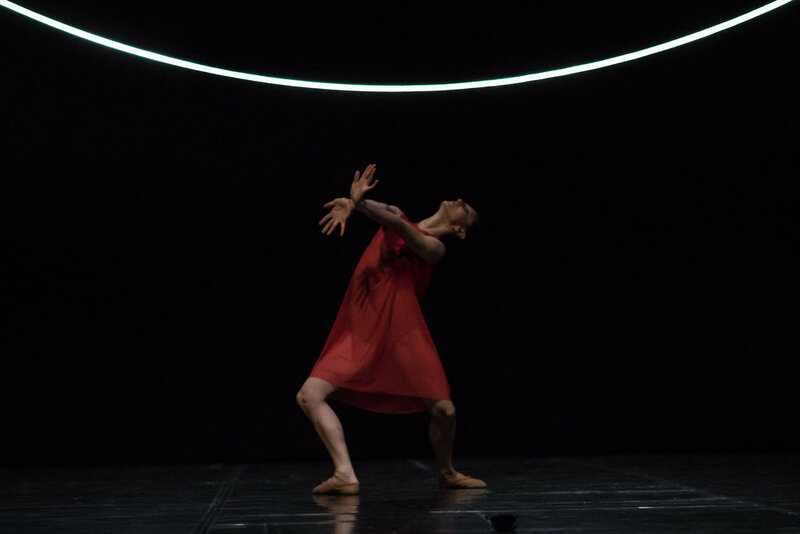 Taking its core base on the combination of the very sharp and fierce composition from Penderecki and the monotonous blue inspiration from the painter Yves Klein, this ballet assembles two antithetical yet complementary forces. The one, calm and placid of a soft and constant flow; the other, rough and piquant, made of sudden burst and explosion. These two energies flowing through the stage are the receptacle of our inner own struggles and aspiration in life, like two sides of a same personality, of our own contrasts and paradoxes, of our anxieties and calmness. The sharp nervous movements of the dancers, the threatening music tones of the Sinfonietta from Krzysztof Penderecki and the sharp blue shades of the scene visually inspired by Yves Klein, really creates an thrilling feeling that we often feel when we are overwhelmed with events and uncertainties in our lives. The piece started with alacrity and never stopped. It was a terrific performance, clean and powerful, sinuous and nuanced when it needed to be–with great lighting and vivid costumes to match. The reason people choose to dance is the joy. The freedom. And Chaix clearly understands this and that gifted dancers can fly.